Bonsai are potted trees or shrubs that have been pruned and trained so that they grow to no more than around 1 meter (3 feet) high. Even though they're small, they have the appearance of full-size trees growing in a forest. Some bonsai trees live for over a hundred years and are lovingly passed down from one generation to the next. A great deal of care is needed to maintain a tree's health in a small pot. 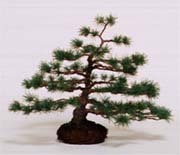 Some of the more important techniques for raising bonsai are described below. Branches are pruned with scissors and other tools to adjust a tree's shape. A young bonsai being pruned for the first time requires particular care, since its basic shape and style will be decided then. When the tree gets a little older, branches are cut to achieve a better balance, taking into consideration things like the direction, density and length of the branches. A bonsai that is nearly fully grown is pruned to maintain and enhance its beauty. Bonsai are living plants and will get bigger if nothing is done to keep them small. Pruning helps control their size, but its purpose is not to stunt a bonsai's growth; it's a technique for tapping the natural tendency of plants to grow to create shapes that are pleasing to the eye. When and in what ways branches are cut vary depending on the type of plant. Proper pruning can promote the healthy growth of bonsai by allowing it to receive plenty of sun and air. Wiring involves attaching wires to the trunk and branches to create a desired turn or correct an unnatural curve. Aluminum and copper wires are commonly used, although aluminum is easier to manage and is suited for beginners. Wires come in more than 10 different thicknesses; which one is used depends on the size and hardness of the branch. Wires are usually wrapped from the trunk and then from the lower to the upper branches, although they sometimes cover just a small part of the tree that needs to be altered. When the wires are left on for too long, they can start eating into the enlarging branches and injure the plant. Bonsai growers have to be careful to remove the wiring before this happens. When a desired effect isn't obtained, a tree may have its trunks and branches wired all over again. Wiring is a way of producing a more pleasing shape; it's not a way of forcing a cultivator's ego onto a bonsai. The wires are used to bring out each tree's true "personality" and distinctiveness, not to suppress them. Some people feel sorry for a tree that's all wired up, but this is part of a disciplining process similar to the training kids must get before they can become mature adults. Growers don't look down on their bonsai; they regard the plants as a friend or a child on whom they lavish their love to help them grow strong and healthy. Wiring is a way to help a tree reach its full potential. The key to having a healthy bonsai is to keep its roots fit. This requires regular repotting, a process where overgrown roots are pruned and replanted in new soil. First of all, the bonsai must be freed from the pot, and the soil carefully removed from the roots. The roots are then trimmed by about one-third. When replanting, you have to be careful not to leave any pockets of air in the soil. The same pot may be used again or a larger one chosen to accommodate a bigger tree. Color and shape are also important considerations in choosing a pot. 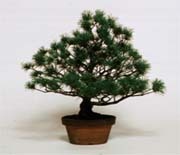 The bonsai depends on the small amount of soil in a container for survival. When the pot becomes filled with roots, the trees' growth becomes stunted, and it becomes harder for the plant to absorb water and air through the soil. Thus repotting can increase a bonsai's longevity.